Hartford Badges was a spin off of Hartford Engraving, the first computerized engraving house in the country. Hartford Engraving was one of the first to use ID card printers for name badge production. 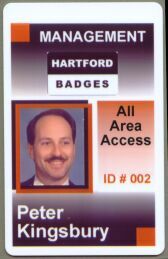 The division producing full color name badges and ID cards was later spun off as a separate company, becoming Hartford Badges. Hartford Badges is a wholly owned division of Decision Support Dynamics, LLC. Managed and owned by the brother and sister team of Peter and Ann Kingsbury. We moved to our new office in May of 2000. We're located in Western New York State, about 20 miles south of Buffalo. Both of us work all aspects of the business, however I spend most of my time working in billing, quality control and shipping. I concentrate my efforts on design, customer service and administration. I'm also responsible for designing and maintaining this web site. 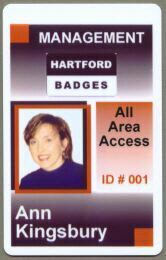 All of our designs, whether preliminary or final, are copyrighted by Hartford Badges. Using one of our designs or a substantially similar design for production at another manufacturer is in violation of copyright laws. We will take your credit card information over the phone or via fax. Orders paid by credit card are shipped to verified addresses only. Bottom line, we won't do them, we never have and never will. This printing process can produce up to 16,000,000 colors on a name badge or photo ID card. The sky’s the limit!